My 5 and 3-year-old daughters love to get “stuff.” It doesn’t matter what that “stuff” is – my daughter ran out of her room this morning, thrilled because she found a blue “fuzzy” (aka lint) in her room, and wasn’t it so soft? – but regardless, their penchant for wanting more runs high. Even though this is the third year we’ve done our Advent Acts of Kindness (did you see our cute printable this year?!) the idea of Christ-centered giving to others during the Christmas season is still something we’ve struggled to foster in our daughters. On the other hand, they love to be “helpers.” So this year, I’ve decided to start incorporating the “stuff” and the “helping” together. Each day during the month of December, I’ve planned out an activity for us to do together. Some days, we’ll do something fun together, and look for spontaneous ways to give to others (i.e. take a trip to an indoor playground and leave quarters on a vending machine). Other days, the day's activity will center around giving to others (i.e. making Christmas cookies or baskets of goodies to give away). After all, when I think back on my own childhood, I don't even remember the "stuff," I remember the experiences: The long car ride to North Dakota, eating Grandma's fudge stored in the porch, taking walks down Main Street to the dime store, getting up early on Christmas day so I could mow through the chocolate in my stocking and watch "Inspector Gadget" on Nickelodeon, waiting impatiently for Grandpa to get up so we could open presents, having lefse with dinner. With that in mind, I want our Christmas experiences as a family to match the heart of Jesus. Yes, we want to have fun -- I guarantee he had fun performing miracles! -- but we also want to love others extravagantly. Jesus met people's needs and brought them joy, and that's what we want to do, too. 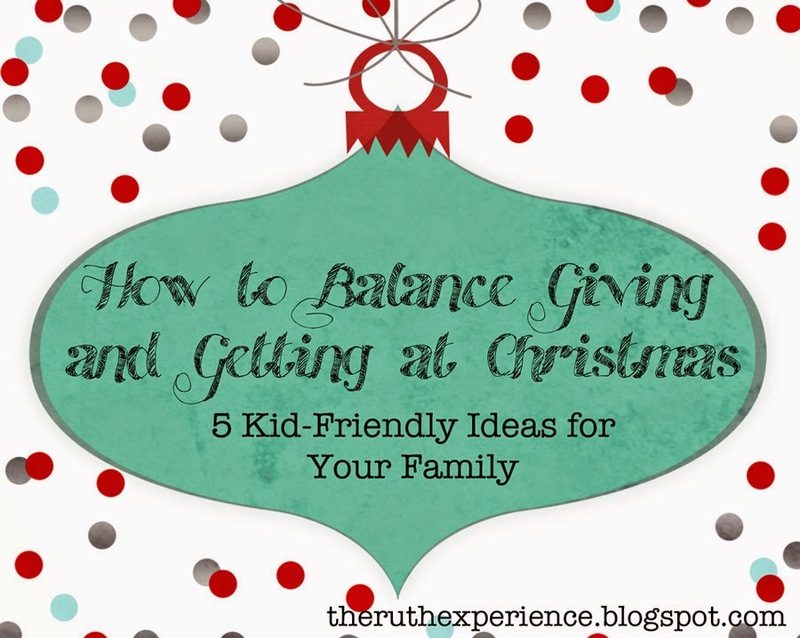 To get us started, I've come up with five easy ways to balance the giving and getting aspects of Christmas. 1. Get organized. 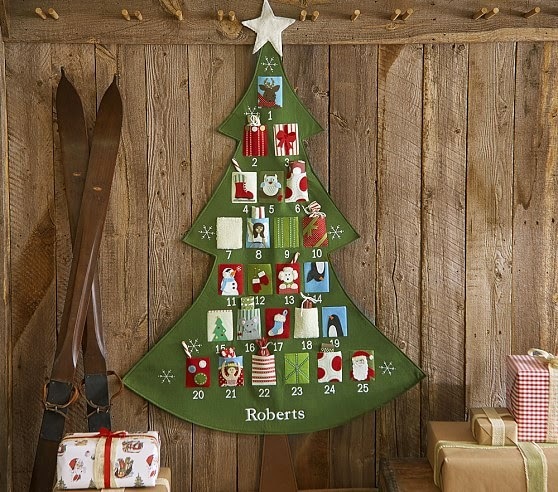 First, I bought a beautiful Advent tree (mine was from Pottery Barn Kids, but I also think something like this Redeemed Christmas - Countdown to Christmas - Wooden Advent Chalkboard or Love Came Down - Felt Advent Calendar would work, plus they're cheap!) that I’ve placed the slips of paper detailing each day’s activity in. Another idea I heard of was wrapping up 25 books (separately) to read during the weeks of Advent. If you go that route, it would be easy to slip your piece of paper into the front of each book. 2. Find some inspiration. I found a sturdy board book called Countdown To Christmas with short, page-long devotionals in it to read with my girls before we find out what our activity that day will be. - Ann Voskamp's newest book, Unwrapping the Greatest Gift: A Family Celebration of Christmas , has gotten excellent reviews, although it might be best for children who are a bit older than mine. Each day includes a Scripture and devotional to read together. 3. Come up with daily activities. Don't forget to get your spouse and kids on board. It doesn't hurt to ask your children if there is something specific they want to do. Have they been begging you to go sledding? Do they have a charity their classroom at school is giving to this month? They'll feel more involved if they have a stake in the outcome. - Cellophane bags are cheap and great for candy or other small gift items. I've found them at the dollar store, or you can buy bulk cellophane bags online. I also really like these cellophane Christmas cookie tray bags , as I feel they'd solve my problem of "how to keep the clingwrap on the plate of cookies without it falling off." - Giving away home-baked goodies? A cookie box would offer extra stability. (FYI since I was looking at the site last night, they have free shipping on any order -- no minimum -- through tonight (Wednesday night)) that we can put together to include in the things we give away. Sunday: Decorate a mason jar to put spare change in the next few weeks (if I know my girls, it will have lots of glitter on it). Once we're done accumulating the funds, we're excited to help this organization achieve a building dream in Swaziland! Monday: Create and send a postcard to a child with a life-threatening illness (organizations like Send Kids the World are great). 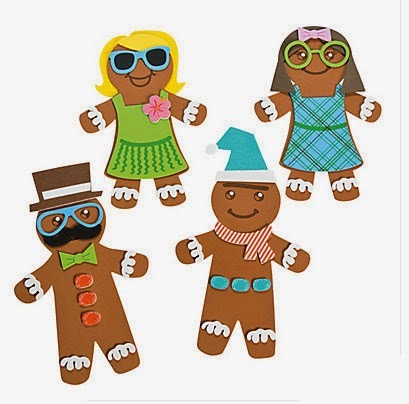 Tuesday: Bake cookies for Elise's preschool teachers, and bring them to school with us that afternoon. Wednesday: Put together a bag of goodies and gift card to place in the mailbox for our mail carrier. Thursday: Since Elise's class is donating baby items to a local charity, pick out a few necessities at Target that morning that Elise can then bring to school. Friday: Spend the day at the Children's Museum, and look for a spontaneous way to help someone else (pay for someone at the drive thru or gas station, leave quarters at the parking meter, etc). Saturday: Make a trip to St. Cloud to drop off items for moms and kids at Anna Marie's Womens Shelter, then go out afterwards for hot chocolate at Caribou or stop at Grandma and Grandpa's house for a visit. If you are looking for additional kindness resources, sign up for our email list. We send out a monthly newsletter filled with resources and freebies. You can also join our Facebook Intentional Kindness Community and follow us on Instagram as The Ruth Experience for additional encouragement, ideas, and camaraderie. 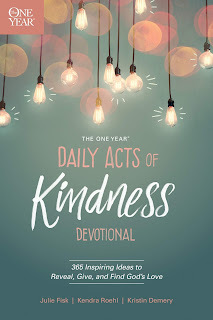 Finally - have you bought our book, The One Year Daily Acts of Kindness Devotional? It is the story of how our families embarked on a one year journey of kindness - our successes, failures and how If you already have our book and love it, we'd so appreciate it if you leave a review on Amazon. God redeemed it all in the most incredible ways. We would love to walk alongside you in encouragement, inspiration and community. What other Christmas/Advent traditions have you incorporated with your children? I'd love to hear! Today we're once again linking up with the lovely Holley Gerth and Jennifer Dukes Lee. Also, this post contains affiliate links for your convenience. What an amazing treasure chest of ideas! Being the only girl in the house (other than the dog) I sometimes feel like I'm the only one who wants to craft or bake or be creative, but I think I can wrangle the boys for a few of these great ideas. Especially if they involve food at the end. Thanks for sharing...your neighbor at Jennifers'. Thank you so much for teaching your kids to see & bless others!! Appreciate you sharing about BIG Dreams for our Bheveni Community in Swaziland!! Thanks, Danielle! It's our pleasure to help out a bit. :) We love projects like this!